A few years back I created a strawberry cream pie that quickly became a favorite in my circle. A fresh, custardy celebration of vanilla, rum and stewed seasonal berries, the summery dessert has become a common craving and repeated request. But whenever I’ve returned to the recipe, I’ve had the urge to clarify and simplify the method, to add more photos of the process, and to hone the ratios of a few of the ingredients. Cheered on by happy taste-testers, I recently served it multiple times, and I’m thrilled to finally present a new and improved recipe. I realize it looks long, but the length is partly due to my newly included details (and don’t miss the shortcut and do-ahead suggestions at the end of this post, along with some notes on ingredients). Cool, refreshing and flavorful, this pie flaunts a splash of rum and vanilla bean that offer a complementary warmth to the strawberries’ inherent tartness. The soft-set filling is a joy and ease to eat, speckled with delightfully tiny seeds and slathered with fluffy whipped cream. Crisp, buttery and nutty, the crust’s texture is both protected and enhanced by a glaze of rich white chocolate, creating a perfect vessel for each mouthful of lusciousness. Preheat oven to 350 F. Measure out 2 tablespoons butter; set aside for white chocolate step. Use 1 teaspoon of remaining butter to thoroughly grease the inside of a 9” pie pan (preferably glass). Melt the leftover butter; set nearby. Pulse graham crackers, almonds, vanilla bean, and salt (if using) in a food processor until evenly crushed into fine crumbs. Add the melted butter and pulse for a few more seconds, stopping to scrape the bottom and sides of bowl with spatula. Mixture should hold together when pinched between your fingers. Transfer mixture into greased pie pan, pushing firmly to create an even, tight crust. If pan is glass, hold it up to the light to check for any thin spots needing more crumbs. Bake at 350 F for 15 minutes. (Feel free to start preparing for cooking the pie filling while crust is in the oven — see below.) When ready, crust should be fragrant with toasty edges. Remove crust from oven; turn off oven. If crust has slid down or puffed up in any places, gently press it back into place with the backside of a spoon while still hot. While crust begins to cool, melt the white chocolate in a double boiler stirring constantly – or in the microwave for a few 20 second intervals, stopping and stirring in between. Be careful not to overheat the white chocolate; stop heating it as soon as it stirs smoothly, lump-free. Immediately whisk in 2 tablespoons soft butter until blended. This will thicken the white chocolate slightly. Working quickly, spread it gently onto bottom and sides of the warm crust as evenly as possible. Be careful not to pull upward on the crust, which would dismantle the crumbs. Place in fridge or in a cool space. Set a fine to medium mesh sieve nearby, and have the chilled crust easily accessible. Make the rum custard: Whisk together ¼ cup of the sugar, eggs, egg yolks, rum, vanilla bean, and salt in a heatproof bowl that will fit over a medium saucepan. Fill saucepan with an inch or two of water and bring to a simmer. When ready to cook the custard (see note), set the bowl over the pan of simmering water; the bottom of the bowl should be near the surface of the water but not touching it. Whisk egg mixture constantly over the simmering water. After about 6-8 minutes, or when custard is thick enough to hold a deep trail (about the consistency of sour cream), remove bowl from heat and set aside. Prepare the strawberries: Whisk together remaining ¼ cup sugar and the cornstarch in a small bowl; set aside. Rinse and dry the strawberries. Hull the strawberries and cut into halves or quarters depending on size, placing them directly into a medium saucepan. Pour the lemon juice over the berries. Cover with lid and set over medium heat. Cook covered for 10 minutes, uncovering briefly halfway through to stir once. At the 10 minute mark, remove lid and sift the sugar-cornstarch mixture over the strawberries. Mix well and continue cooking uncovered, constantly whisking. 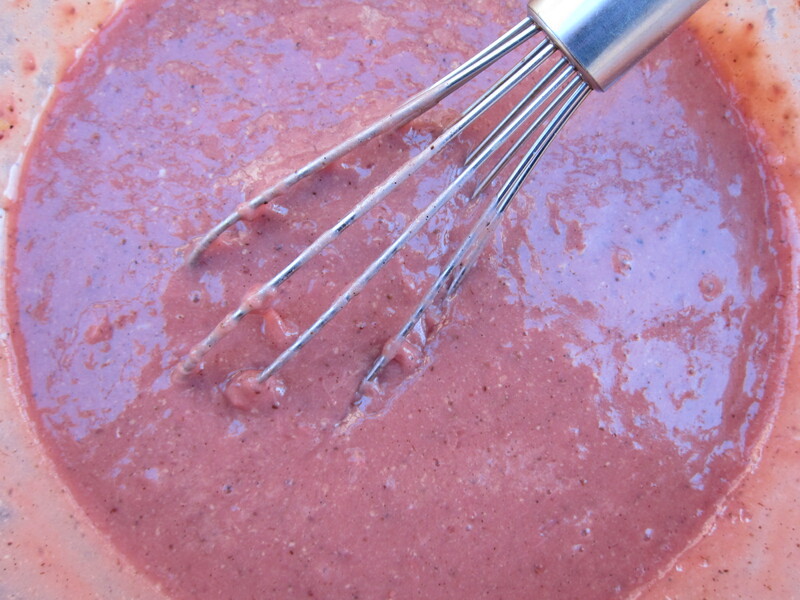 Use the whisk to mash the berries, creating a less chunky texture. 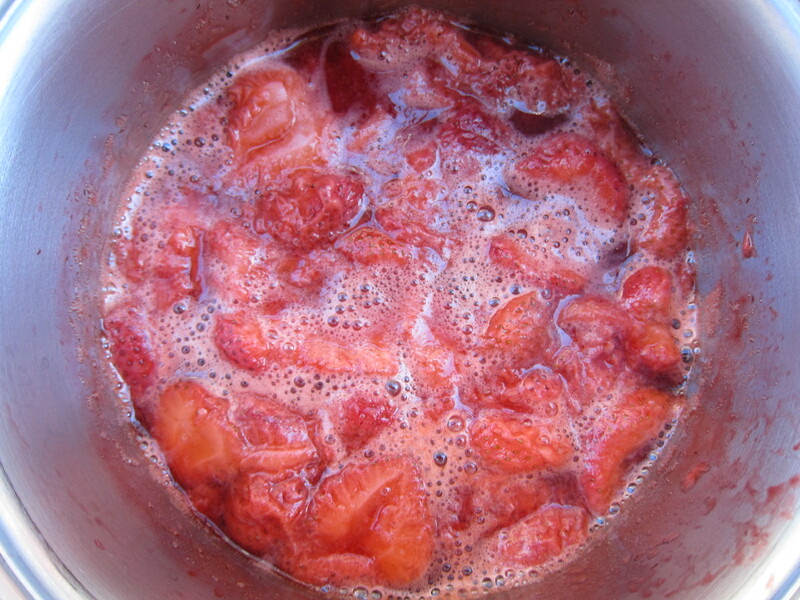 After 4-5 minutes, or when berries are thickened to a jam-like consistency with slow, large bubbles, remove from heat. Immediately transfer hot strawberry mixture into the bowl of custard, and whisk vigorously until fully blended together. Place the sieve over a clean bowl (or directly above the chilled pie crust if you have someone or something to help hold it there), and pour the strawberry mixture into the sieve. Gently push the mixture through the sieve by stirring it with a whisk. Be sure to scrape the backside of the sieve to retrieve any hidden pie filling. Spread mixture into pie crust, evening it to the edges. Cover pie and place in refrigerator, chilling at least 5 hours or overnight (up to 12 hours before adding whipped cream and serving). Fibers and bits left behind in sieve. Place cream, vanilla bean, sugar and rum in a mixing bowl. Beat on high until voluminous and quite thick (it should be firm enough to hold its shape but still fluffy). Pipe or spread evenly over pie. Decorate with strawberries if desired. Keep pie chilled and serve as soon as possible — up to 8 hours after slathering with whipped cream. The crust can be made days ahead of time: after coating it with white chocolate and letting it cool, wrap it tightly and refrigerate it for up to two days or freeze for up to a week. If you’re filling the crust the same day you make it, you can set up for making the filling while the crust is in the oven (e.g., cutting strawberries, combining the custard ingredients, setting out water and saucepans). The rum custard needs to be ready by the time the strawberries are done cooking, but you can overlap the two steps. If your custard ingredients are ready to go, you should have time to make it during the time that the strawberries are stewing. Pushing the pie filling through a sieve is technically optional (though it does ensure that any bits of egg or excessive strawberry fibers and seeds will be prevented from showing up in the slices). Seeds scraped from whole vanilla beans are as fresh as it gets, but this route can be tedious. Prepared vanilla bean paste or powder are a great shortcut, and I trust you’ll become as addicted to their presence in the pantry as I am. As for the liquor, I recommend dark rum for its depth and caramely notes; spiced rum (which I used to insist on) is also quite nice but not absolutely necessary. If you can find this kind, it’s really warm with vanilla flavor, and has become my favorite for baking. When it comes to white chocolate, I know people who reject it entirely and claim it’s not chocolate at all. While this dismissive attitude can be frustrating, I say they’re right and wrong at the same time. If they’re referring to the strange stuff in the baking aisle that contains waxes or hydrogenated oils as their only fat, then, yes: that’s not chocolate. On the other hand, there is world of white chocolate made with cocoa butter, which is undeniably part of the cocoa bean. The high quality stuff (like this one) – with cocoa butter listed as one of the first ingredients – is a really lovely item, and unlike darker chocolates, it doesn’t overpower delicate flavors. If I’m craving this in the winter, I might try making it with frozen strawberries. In the meantime, I find that two full pounds is the perfect amount of fresh strawberries for the pie filling and decoration (but I always buy extra for snacking, too). This entry was posted in Baking with Booze, Pies, Tarts, Tortes & Cheesecakes, Sweets and tagged graham cracker, icebox pie, pie, rum, strawberries, strawberry, vanilla bean. Bookmark the permalink. This looks like the perfect breakfast on a hot summer day. Hi Katy, Thank you — I fully agree with your breakfast philosophy! And I feel the same about commenting on your blog. I always read your posts, gush over your beautiful writing, thoughts, and photos — and could tell you this every time — but then I get distracted or run out of time before commenting these days. Now that you’re on WordPress, maybe I’ll get better about that (when I actually log in! ).